Coordinating shades per Color Assortment – Light, Medium & Dark! Easily coordinate with Stampin' Up! colors! Work great with the Whisper White Cardstock! To help you get started using the Stampin' Blendabilities, I've put together a video touching base on my Top 10 Tips & Techniques for using the Blendabilities. I've had about 2 months to play with the Blendabilities as well as share what I've learned with other demonstrators. So, check out the video then don't forget to place your order TODAY for the Stampin' Blendabilities. Stamp image with Memento Tuxedo Black Ink! Protect your workspace – the Alcohol markers will bleed through your cardstock as you saturate the cardstock with color. Start with the Darkest Shade. Only add a small line of the Dark Shade then overlap with the Medium shade followed by the Lightest shade. NOTE… Leave a small white space between the color up to the stamped edge which allows for the color to BLEED towards the edge without overlapping the stamped edge. Blend each shade by using the FINE tip of your marker. Overlap the Lightest Shade over the Medium and Darkest shades to blend along with pushing color to the edge of the stamped image. Leave lots of WHITE SPACE to fill in with the Lightest Shade to increase the graduated fading effect. Work the COLOR! When blending the colors you are adding & overlapping color so blend the color by working IT! NOTE… Don't be afraid to push hard with the fine tip of the marker when blending. Don't over think the LIGHT source for your project especially as a beginner. Work one SMALL area at a time! One Leaf, One Petal… One section at a time working quickly to blend each shade! Have FUN… Relax and enjoy the process! Explore the colors and shading. What works for one person may not be the same process that works for another person. Stop by tomorrow to see the finished card using the Blended Bloom colored in this video! 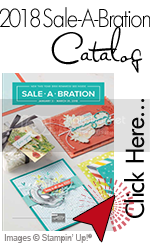 Buy your Stampin' BLENDABILITIES today! To purchase the Stampin' Blendabilities, visit my 24/7 Stampin’ Up! store by clicking HERE! For your convenience, you can find the supply list with product numbers listed at the end of this post. I invite you to pin any of my creations and videos to Pinterest and to share your thoughts or questions by leaving me a comment. I love hearing from all my readers – word of mouth is one of the greatest forms of flattery. Great video Pam. You gave me some great pointers and actually got 5 colors out of 3. I never would have thought of going lighter towards the end with the light marker. Instant 4th color and adds a wonderful dimensional factor. Thanks Cindy… I love using the Blendabilities and so glad you could pick up some useful information from my video 🙂 Caleb LOVED helping me with the video. He seems to be a little task master especially when it comes to doing videos and loves to help me with my videos.